So you just bought a plant at a store and it was simply labeled “succulent”. We’ve all been there. If you have narrowed it down to either Echeveria or Sempervivium you’re already doing better than most of us. Here are a few key pointers to help you figure out the genus of your plant. While this isn’t a visual indicator of which genus you’re looking at, this background can help you care for it once you’ve figured it out. Simply, Sempervivum are frost-resistant and Echeveria are not. Sempervivum are native to colder regions like Europe. They experience winter every year, and can survive it. This is a great boon if you keep your plants outdoors. Most Echeveria, however, are from places like Mexico. They expect heat so they are not equipped to deal with cold. If your plant dies after a surprise frost, you can probably guess which kind it was. This is simultaneously the reason they are confusing, but also your best bet for differentiating them. 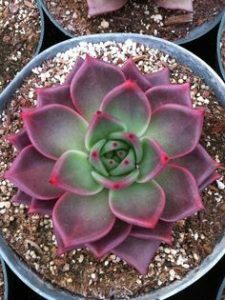 Echeveria have rounded, plump leaves that are so typical of succulents. They often end in a sharp point like a spike. “But Sempervivums are also rounded and spiky!” That’s true – the distinction is made by comparing their plumpness. 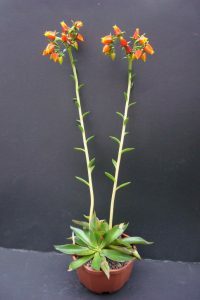 Echeveria are usually noticeably thicker. 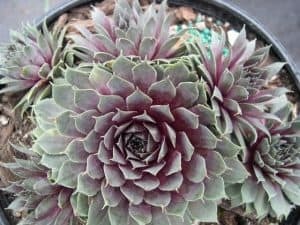 Both plants have tightly-packed rosettes, but due to the thickness of Echeveria leaves, there are usually less leaves around a rosette than in Sempervivum. The only issue with determining genus by leaf shape is that if you’re not already intimately familiar, it’s hard to tell without comparing them side-by-side. You and I are not the first to have difficulty identifying the genus of these plants. Their similarity has led to people calling both kinds “hens and chicks”, which is unfortunate because they were confusing enough before we started calling them by the same name! There is a clever trick, however, that you can employ when chicks are present. Echeveria chicks tend to hang out under their mother “hen”. They’re often not visible until you move leaves around or they get much larger. Sempervivum chicks, on the other hand, are very visible. They tend to sprout adjacent to the mother rather than under the umbrage of her rosette. They will always be hugging close to her though! Echeveria are polycarps. That’s a kind of plant that has multiple flowers arising from one stem. 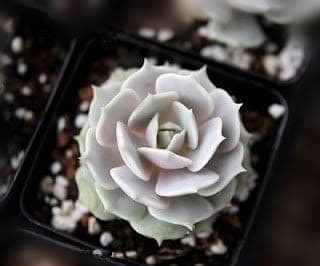 You’ll see this in Echeveria quite clearly – a long, slender stem shoots up from the rosette and at the top a bunch of little flowers will dangle like bells. Eventually the flowers will die and the stalk will wither away and everything will be back to normal. If you want to save your Sempervivum, it is possible! If you see that center stalk starting to grow – snip it! If you catch it early enough, and make a nice, clean cut with some garden scissors, the plant will stop marching to its doom. That’s all the tips I have! Do you have any other methods of telling the difference between Echeveria and Sempervivum? Just a college kid sharing everything he learns on the path to transcendence via succulents. 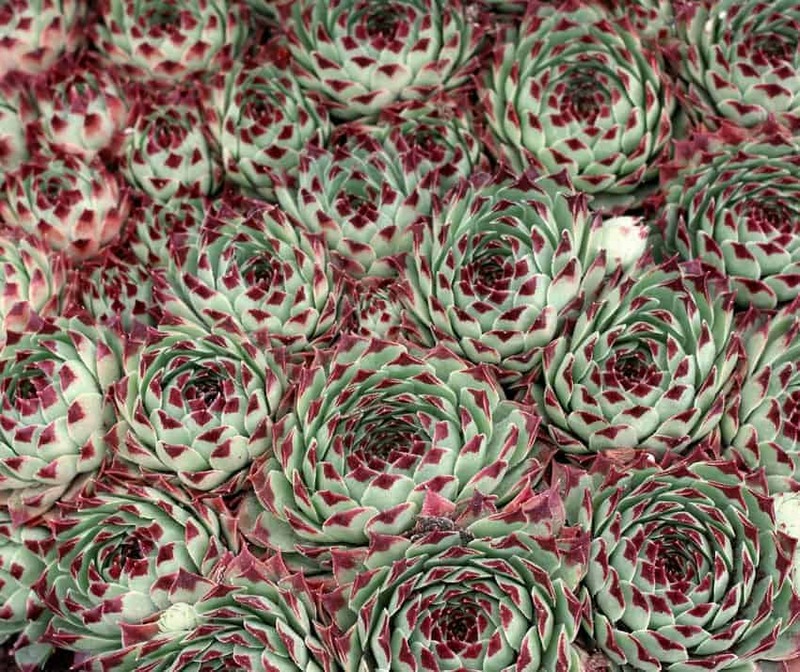 What is the name of the red-tipped succulent pictured at the top of this article (Echeveria vs Sempervivum)? It’s packed together like a sempervivum. Is it one? When I right clicked on photo the name of the file revealed “Sempervivum Tectorum Greenii_04.jpg”. (couldn’t ID all photos -those from Pinterest are named with long random numbers). Have a question or comment? Want to contribute to the site? Drop us a line!